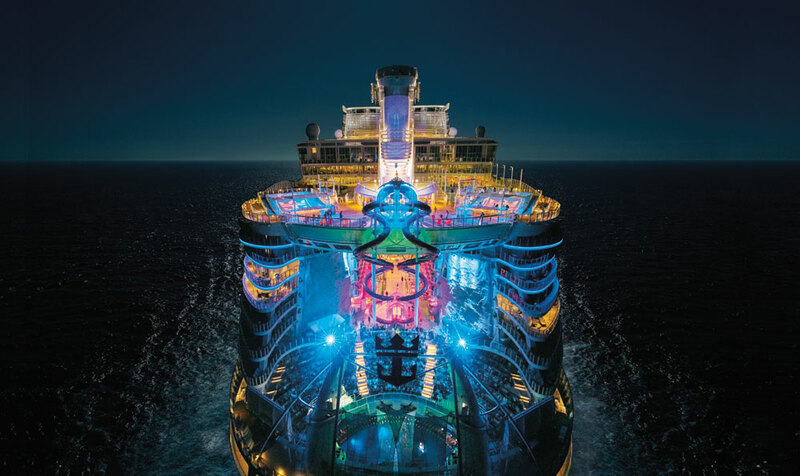 Royal Caribbean is taking the limelight away from Hollywood by featuring the largest movie premiere at sea across all its Oasis-class cruise ships. All this is due to a Netflix movie called “Like Father” which was filmed aboard Harmony of the Seas. Royal Caribbean will host the largest premiere at sea of the original Netflix “Like Father” movie. The premiere will be screened on Symphony of the Seas, Oasis of the Seas, Allure of the Seas and Harmony of the Seas which is the ship the movie was filmed on. It will all take place on August 3 at the ship’s aft AuquaTheater. At the AquaTheater Royal Caribbean guests will enjoy a full-fledged premiere just like on land. Leading up to the movie will be a special event on the Boardwalk neighborhood featuring a live DJ, face painting, delicious treats and beverage specials. The movie will then be on two large screens in the nearby AquaTheater. Like Father was filmed on Harmony of the Seas starring Kristen Bell who’s character was left at the altar and is an advertising executive workaholic. She still ends up going on her honeymoon cruise but doesn’t expect to be dragging along her estranged father who is played by Kelsey Grammer. The new movie is written, directed and produced by Lauren Miller Rogen and it will also be available on Netflix from August 3. The movie showcases all the features which Harmony of the Seas has on offer including the FlowRider, The Perfect Storm water slides, Rising Tide Bar and even Royal Caribbean’s own private destination of Labadee, Haiti. Harmony of the Seas is one of the largest cruise ships in the world and is 226,960 gross tons with a guest capacity of over 5,400. The vessel is currently based out of Fort Lauderdale, Florida sailing 7-night Eastern Caribbean cruises including calls in Labadee, Falmouth in Jamaica and Cozumel in Mexico.